It has been almost forty years since the Voyager 1 and 2 missions visited the Saturn system. As the probes flew by the gas giant, they were able to capture some stunning, high-resolution images of the planet’s atmosphere, its many moons, and its iconic ring system. In addition, the probes also revealed that Saturn was slowly losing its rings, at a rate that would see them gone in about 100 million years. More recently, the Cassini orbiter visited the Saturn system and spent over 12 years studying the planet, its moons and its ring system. 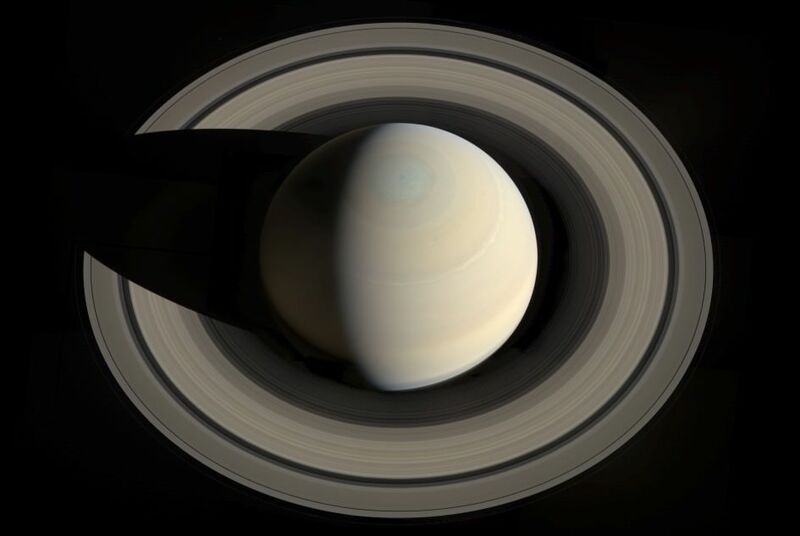 And according to new research based on Cassini’s data, it appears that Saturn is losing its rings at the maximum rate predicted by the Voyager missions. According to the study, Saturn’s rings are being gobbled up by the gas giant at a rate that means they could be gone in less 100 million years. In 1997, the NASA/ESA Cassini-Huygens mission launched from Earth and began its long journey towards the Saturn system. In 2004, the Cassini orbiter arrived around Saturn and would spend the next thirteen years studying the gas giant, its rings, and its system of Moons. On September 15th, 2017, the mission ended when the probe entered Saturn’s upper atmosphere and burned up. This was known as Cassini’s “Grand Finale“, which began with the probe plunging into the unexplored region that lies between Saturn’s atmosphere and its rings and culminated with live coverage of it entering the atmosphere. In honor of the mission and NASA’s outstanding coverage of its final months, NASA was recently nominated for an Emmy Award by The Academy of Television Arts & Sciences. The award is in the category of Outstanding Original Interactive Program, which recognizes the JPL’s multi-month digital campaign that celebrated the mission’s science and engineering accomplishments – which included news, web, education, television and social media efforts. It is also a nod to the agency’s success in communicating why the spacecraft concluded its mission in the skies of Saturn. Essentially, the spacecraft was intentionally destroyed in Saturn’s atmosphere to prevent the possibility of it contaminating any of Saturn’s moons. Throughout the thirteen years it spent studying the Saturn system, Cassini found compelling evidence for the possible existence of life on Titan and in Enceladus’ interior ocean. In addition, scientists have speculated that there may be interior oceans within Rhea and Dione. In this respect, Cassini ended its mission the same way the Galileo probe did in 2003. After spending 8 years studying Jupiter and its system the moons, the probe crashed into the gas giant’s upper atmosphere in order to prevent any possible contamination of Europa or Ganymede, which are also thought to have an interior oceans that could support life. The “Grand Finale” campaign began on April 26th, 2017, and continued until the craft entered Saturn’s atmosphere on Sept. 15th, 2017, with the spacecraft sending back science to the very last second. The campaign utilized several different forms of media, was interactive, and was very comprehensive, providing regular updates and vital information about the mission. The short film, titled “For Your Consideration: The NASA Cassini Grand Finale“, showcases the missions many accomplishments, pays tribute to all those who made it happen and who helped inform the public and communicate the importance of the mission. The Primetime Emmys will be awarded be on September 17th in Los Angeles. The Creative Arts Emmys, which includes interactive awards, will be presented during a separate ceremony on Saturday, Sept. 15th, at the Microsoft Theatre in Los Angeles. Other contenders include Back to the Moon, a Google Spotlight Stories App; Blade Runner 2049: Memory Lab, Coco VR, and Spiderman Homecoming, three Oculus VR experiences. On September 15th, 2017, after nearly 20 years in service, the Cassini spacecraft ended its mission by plunging into the atmosphere of Saturn. During the 13 years it spent in the Saturn system, this probe revealed a great deal about the gas giant, its rings, and its systems of moons. As such, it was a bittersweet moment for the mission team when the probe concluded its Grand Finale and began descending into Saturn’s atmosphere. Even though the mission has concluded, scientists are still busy poring over the data sent back by the probe. These include a mosaic of the final images snapped by Cassini’s cameras, which show the location of where it would enter Saturn’s atmosphere just hours later. The exact spot (shown above) is indicated by a white oval, which was on Saturn’s night side at the time, but would later come around to be facing the Sun. From the beginning, the Cassini mission was a game-changer. After reaching the Saturn system on July 1st, 2004, the probe began a series of orbits around Saturn that allowed it conduct close flybys of several of its moons. Foremost among these were Saturn’s largest moon Titan and its icy moon Enceladus, both of which proved to be a treasure trove of scientific data. On Titan, Cassini revealed evidence of methane lakes and seas, the existence of a methanogenic cycle (similar to Earth’s hydrological cycle), and the presence of organic molecules and prebiotic chemistry. On Enceladus, Cassini examined the mysterious plumes emanating from its southern pole, revealing that they extended all the way to the moon’s interior ocean and contained organic molecules and hydrated minerals. These findings have inspired a number of proposals for future robotic missions to explore Titan and Enceladus more closely. So far, proposals range from exploring Titan’s surface and atmosphere using lightweight aerial platforms, balloons and landers, or a dual quadcopter. Other proposals include exploring its seas using a paddleboat or a even a submarine. And alongside Europa, there are scientists clamoring for a mission to Enceladus and other “Ocean Worlds” to explore its plumes and maybe even its interior ocean. Beyond that, Cassini also revealed a great deal about Saturn’s atmosphere, which included the persistent hexagonal storm that exists around the planet’s north pole. During its Grand Finale, where it made 22 orbits between Saturn and its rings, the probe also revealed a great deal about the three-dimensional structure and dynamic behavior of the planet’s famous system of rings. It is only fitting then that the Cassini probe would also capture images of the very spot where its mission would end. The images were taken by Cassini’s wide-angle camera on Sept. 14th, 2017, when the probe was at a distance of about 634,000 km (394,000 mi) from Saturn. They were taken using red, green and blue spectral filters, which were then combined to show the scene in near-natural color. The resulting image is not dissimilar from another mosaic that was released on September 15th, 2017, to mark the end of the Cassini mission. This mosaic was created using data obtained by Cassini’s visual and infrared mapping spectrometer, which also showed the exact location where the spacecraft would enter the atmosphere – 9.4 degrees north latitude by 53 degrees west longitude. The main difference, of course, is that this latest mosaic benefits from the addition of color, which provides a better sense of orientation. And for those who are missing the Cassini mission and its regular flow of scientific discoveries, its much more emotionally fitting! While we may never be able to find the wreckage buried inside Saturn’s atmosphere, it is good to know where its last known location was. When the Cassini spacecraft arrived around Saturn on July 1st, 2004, it became the fourth space probe to visit the system. But unlike the Pioneer 11 and Voyager 1 and 2 probes, the Cassini mission was the first to establish orbit around the planet for the sake of conducting long-term research. Since that time, the spacecraft and its accompanying probe – the Huygens lander – have revealed a startling amount about this system. On Friday, September 15th, the Cassini mission will official end as the spacecraft descends into Saturn’s atmosphere. In part of this final maneuver, Cassini recently conducted one last distant flyby of Titan. This flyby is being referred to informally as “the goodbye kiss” by mission engineers, since it is providing the gravitational push necessary to send the spacecraft into Saturn’s upper atmosphere, where it will burn up. In the course of this flyby, the spacecraft made its closest approach to Titan on Tuesday, September 12th, at 12:04 p.m. PDT (3:04 p.m. EDT), passing within 119,049 kilometers (73,974 mi) of the moon’s surface. The maneuver was designed to slow the probe down and lower the altitude of its orbit around the planet, which will cause it to descend into Saturn’s atmosphere in a few day’s time. The flyby also served as an opportunity to collect some final pictures and data on Saturn’s largest moon, which has been a major focal point for much of the Cassini-Huygens mission. These will all be transmitted back to Earth at 18:19 PDT (21:19 EDT) when the spacecraft makes contact, and navigators will use this opportunity to confirm that Cassini is on course for its final dive. In the course of making its many flybys, the Cassini spacecraft revealed a great deal about the composition of Titan’s atmosphere, its methane cycle (similar to Earth’s hydrological cycle) and the kinds of weather it experiences in its polar regions. The probe also provided high-resolution radar images of Titan’s surface, which included topography and images of its northern methane lakes. Cassini’s first flyby of Titan took place on July 2nd, 2004 – a day after the spacecraft’s orbital insertion – where it approached to within 339,000 km (211,000 mi) of the moon’s surface. On December 25th, 2004, Cassini released the Huygens lander into the planet’s atmosphere. The probe touched down on January 14th, 2005, taking hundreds of pictures of the moon’s surface in the process. In November of 2016, the spacecraft began the Grand Finale phase of its mission, where it would make 22 orbits between Saturn and its rings. This phase began with a flyby of Titan that took it to the gateway of Saturn’s’ F-ring, the outermost and perhaps most active ring around Saturn. This was followed by a final close flyby of Titan on April 22nd, 2017, taking it to within 979 km (608 mi) of the moon’s surface. Throughout its mission, Cassini also revealed some significant things about Saturn’s atmosphere, its hexagonal storms, its ring system, and its extensive system of moons. It even revealed previously-undiscovered moons, such as Methone, Pallene and Polydeuces. Last, but certainly not least, it conducted studies of Saturn’s moon Enceladus that revealed evidence of a interior ocean and plume activity around its southern polar region. These discoveries are part of the reason why the probe will end its mission by plunging into Saturn’s atmosphere, about two days and 16 hours from now. This will cause the probe to burn up, thus preventing contamination of moons like Titan and Enceladus, where microbial life could possibly exist. Finding evidence of this life will be the main focus of future missions to the Saturn system, which are likely to launch in the next decade. So long and best wishes, Cassini! You taught so much in the past decade and we hope to follow up on it very soon. We’ll all miss you when you go!